Muharraq is considered as the third largest city in Bahrain, located on Muharraq Island. The city is filled with rich culture, historical monuments, archaeological sites, temples, and many more interesting attractions. Find the cheap flight booking to Muharraq only on Rehlat at exclusive lowest fares. Avail the great deals and offers on Rehlat and experience the low-cost travel only with Rehlat. Rehlat is the fastest growing online travel company in the Middle East and strives to offer budget travel for everyone. Book Muharraq flights from any part of the world to discover the exciting tourist places. Rediscover the magic of Muharraq with wonderful tourist attractions such as Bahrain National Museum, Arad Fort, Beit Al Quran, Busaad Art Gallery, Dohat Arad Park, Fun City, Muharraq Garden, Al Oraifi Museum, Bin Matar House, Bab Al-Bahrain, Prince Khalifa Bin Salman Park, Dolphin Resort, Bahrain Fort, Adhari Park, Rifa Fort and Al Khamis Mosque. Don’t miss a visit to the historic monument, Bu Maher Fort. Visitors can shop from the range of categories such as traditional items, cosmetics, perfumes, gift shops, Arabic sweets and much more. The city offers a wide range of luxury shopping malls and traditional markets all around the city where you can buys trendy clothes, shoes, food, and electronics. The city has few popular malls including Seef Mall Muharraq, Oasis Mall, Master Point, and Al Qaysaria Sooq Muharraq. Taste the Bahraini cuisine in Muharraq such as Machbous, Muchammar, Baba ghanoush, Shawarma and Sambousa including regional drinks Arak and Gahwa. Tourists can find a large number of budget hotels and restaurants serve quality dining options. The city also serves many cuisines such as Indian, Thai, Chinese, Continental and Pakistani food. Muharraq is an amazing place for nightlife in clubs, lounges, and bars. It will be a unique experience for youngsters to enjoy lively nightlife in dozens of popular clubs. Bahrain Public Transport Company offers buses, taxis, and trains to travel across the city. It is easy to get private vehicles and metered taxis to travel from the city centre to neighboring cities at reasonable prices. Bahrain International Airport is the major airport of Bahrain that serves Muharraq. The airport is located around 7 km northeast of Manama, the capital city of Bahrain. The airport is a major hub for DHL International Aviation ME, Gulf Air, Kalitta Air and Swiftair Bahrain. Muharraq Airport serves more than 9 million domestic and International passengers every year. 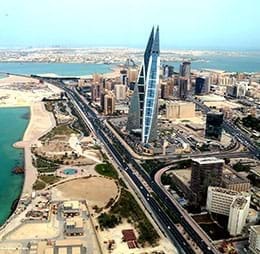 Car is the best option to travel from Bahrain International Airport to centre of the city. It will take around 6 minutes to travel from Muharraq to Bahrain International Airport via Khalifa Al Khabeer Hwy and Arad Hwy, which is about 3.5 kilometres. You can find a number of metered taxis outside the airport arrivals at reasonable prices. You can also take taxis from Speedy Motors, Bahrain Limo, and Arabian Taxi to reach Bahrain International Airport.